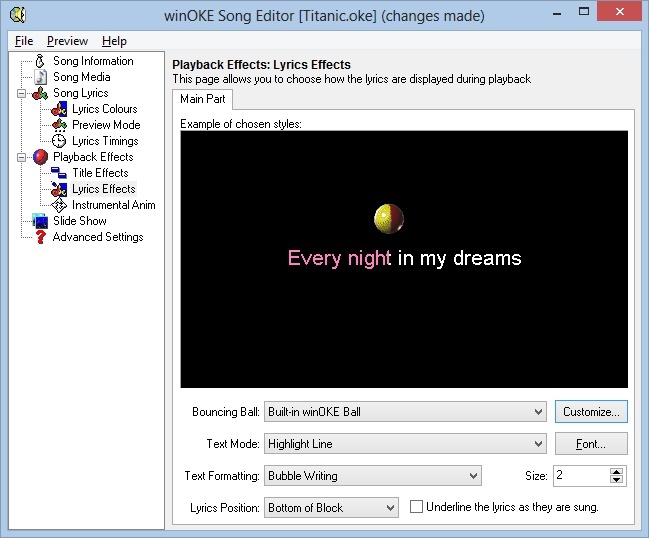 WinOKE is a piece of software for Windows that allows you to create and present karaoke on your home PC without the need for any expensive karaoke equipment. The karaoke presentations play back in the style of your choosing by making use of the many options available that change how the playback looks and behaves. Find songs by Artist, Name, Filename and lyrics! NEW: Images can now be resampled when resized to make them look smoother. This can be turned on/off from Preferences as it slows down startup. Fixed problem with some settings in preferences not being saved if using a restricted user account. Posted by kannika on Thu, 01/17/2008 - 17:15. Posted by Django on Thu, 09/28/2006 - 14:13. Posted by Ramona (via moderator) on Sun, 01/02/2005 - 05:05. I want to record my daughter singing along with a karaoke cd. Can someone please tell me how I can do it. I want to make a cd of her singing. Posted by Myra on Wed, 11/03/2004 - 20:44. Posted by nguyen on Fri, 03/24/2006 - 04:48. Posted by evert on Sun, 06/24/2007 - 11:55. Posted by marilin on Wed, 06/01/2005 - 01:51. Posted by edgar on Fri, 03/11/2005 - 01:10. Posted by Prasurt Nakthong on Sun, 12/19/2004 - 20:44. Posted by kan on Sun, 09/26/2004 - 17:56. Posted by mahesh on Thu, 11/11/2004 - 18:31. Posted by tamekia on Tue, 06/21/2005 - 18:05. Posted by news- on Sat, 08/14/2004 - 22:15. Posted by Houa Thor on Tue, 07/20/2004 - 21:09. How to connect video from pc to tv or vcr when use the winone v3.00, Please show me . Posted by t on Wed, 09/08/2004 - 19:24.
: How to connect video from pc to tv or vcr when use the winone v3.00, Please show me . Answer: Use s-video output from pc or RCA output and connect it to s-video input or RCA input, respectively. You'll find that input either in the front or back of the vcr. Posted by vicente romani wong (via moderator) on Wed, 04/21/2004 - 21:56.
quiero evaluar y comprar winoke, por favor enviarme los datos como comprar, en idioma español . Posted by KEITH on Mon, 12/15/2003 - 21:01. Posted by Brian on Thu, 02/03/2005 - 08:46. Posted by Eduardo on Tue, 05/03/2005 - 02:06. Posted by shay on Tue, 07/20/2004 - 17:44. Posted by jodi on Thu, 08/07/2003 - 01:28.
: Do you know were I can finf tablature to right kind of wrong? I have the song you want, give me a e-mail and i will send it to you! Posted by Bob Schiesl on Thu, 01/16/2003 - 16:50. Ihave an ON-KEY machine which says that I can only use their files. They told me that their files end in (.tsr) Is there some way that I can use your program to load Karaoke disks which end in (.CDA) or will this program help me then?? Posted by nguyen on Fri, 03/24/2006 - 04:53.
: Ihave an ON-KEY machine which says that I can only use their files. They told me that their files end in (.tsr) Is there some way that I can use your program to load Karaoke disks which end in (.CDA) or will this program help me then?? converting MIDI[ floppy disk] to WAV file ? Posted by Larry D, on Thu, 11/28/2002 - 23:07. I'm new to recording so I hope someone can help. I have several Piano solos that were recorded on to floppy disk. These were played on a Roland Electronic Piano. I want to burn these songs on to a CD, and I was told I had to convert them to a WAV file. Can someone explain in layman's terms how to do this ? Re: converting MIDI[ floppy disk] to WAV file ? Posted by betty on Wed, 07/21/2004 - 08:22.
: I'm new to recording so I hope someone can help. I have several Piano solos that were recorded on to floppy disk. These were played on a Roland Electronic Piano. I want to burn these songs on to a CD, and I was told I had to convert them to a WAV file. Can someone explain in layman's terms how to do this ? Posted by darren on Thu, 08/22/2002 - 20:19. Posted by jen on Sat, 11/23/2002 - 09:01.
me too - i can copy vcd films but not sunfly - wonder why that is? please let me know if you find out!! Posted by judy mary on Wed, 03/23/2005 - 20:34. Posted by kelly garcia on Tue, 03/08/2005 - 14:03. Posted by Alan ocallaghan on Fri, 01/17/2003 - 16:02.
did u get any info on copying karaoke disks? do u know where i can download some karaoke disks? u know any programmes to copy?????????? Posted by steve james on Sun, 07/28/2002 - 16:17. Posted by Nereida Kunkel on Wed, 12/08/2004 - 19:15. Check out these sizzling computer bargains. Desktop computers, laptops/notebooks as well as many components and parts. Specials include complete systems, memory, hard drives, motherboards, CRT moniters, Web Cams, printers, programs, DVD burners, USB MP3 players, wireless, memory sticks, video cards, digital cameras to name a few. The list goes on and the prices come down. Interested in building your own computer system? Then insist on quality affordable components with a great backup service. We offer the Best Computer Deals Anywhere - And same day shipping - worldwide. Posted by Karl Moore on Wed, 12/08/2004 - 19:03. Posted by Sherrie on Wed, 05/15/2002 - 01:28. Posted by Joseph Sadilek on Mon, 12/08/2003 - 00:09. Posted by V on Fri, 02/08/2002 - 16:13.
how to convert the karaoke song i made with Winoke to mpeg so that i can play on vcd player? Posted by Houa Thor on Tue, 07/20/2004 - 21:14.
: how to convert the karaoke song i made with Winoke to mpeg so that i can play on vcd player? Posted by meir on Tue, 10/08/2002 - 18:35. Posted by meir on Tue, 10/08/2002 - 18:37.
: : how to convert the karaoke song i made with Winoke to mpeg so that i can play on vcd player? Posted by meir on Mon, 10/07/2002 - 09:46. Desperately need help on burning cd+g discs. Posted by Dj Stevie22 on Tue, 01/29/2002 - 00:56. Please can someone help me. My mate has bought a pub and i need to burn some karaoke discs. I have a Lite-on LTR-16102B which i use for reading and writing as my other reader is naff. The software i normally use for burning is Clone or Easy Cd Creator. I need to know if there is any way i can read and burn the cd+g discs using the hardware i have or even if i can download any software which will let me do this. Any help will be appreciated. Thanx. Re: Desperately need help on burning cd+g discs. Posted by Nicolas (via moderator) on Fri, 12/17/2004 - 01:42. Thirdly, you could (as you wish) download Power CD+G to AVI (or MPG) converter, in order to use your file as an independent video file (VCD, SVCD or DVD format), to be read on any DVD player. Posted by Shelly on Thu, 04/25/2002 - 16:51. I also have a karaoke biz, and I use ONLY the CloneCD program. If your still having trouble burning your CDG's, write to me and we'll get your problem solved. Posted by Car1 on Sat, 11/07/2009 - 20:43. OK, can you help? I have the latest Clone CD and want to make a "clone" copy of my CD-G's "disks" on my hard drive that I can then use with Karaoke Player/songbook software. I prefer clone uncompressed file copies of my CD-G's ie not MP3-G, as hard drive space is not an issue. Posted by Richard Finch on Fri, 07/09/2004 - 11:03. Posted by david on Sat, 06/15/2002 - 23:16.
: I also have a karaoke biz, and I use ONLY the CloneCD program. If your still having trouble burning your CDG's, write to me and we'll get your problem solved. Posted by Justin on Sun, 03/02/2003 - 19:28. What options to select when copying CD+G with CloneCD???? Posted by Mixmasta Tee on Mon, 12/29/2003 - 04:57.
: What options to select when copying CD+G with CloneCD???? Posted by Tom on Sun, 04/13/2003 - 13:59. How do you burn your own CD+G with nero/nti? Posted by Ju on Mon, 10/27/2003 - 07:47.
: How do you or can u even burn your own CD+G with nero?